Nassau County Executive Laura Curran signed an executive order Wednesday barring county workers from releasing personal employee data, a measure aimed at preventing outside groups from "luring" workers from unions after a Supreme Court ruling in June that labor leaders said could weaken union membership. County Executive Steve Bellone penned the first such order on Long Island in the wake of the U.S. Supreme Court Janus v. AFSCME decision a week prior. In a 5-4 decision, struck down a 1977 law that required nonunion employees to pay fees to the union that represents their interests during collective bargaining negotiations. The decision in Janus v. AFSCME said unions could not collect fees from workers without their consent. Similarly, the two executive orders bar the release of public employees' home addresses, personal cell or telephone numbers, as well as personal email addresses. However, the executive order does not apply to "work-related publicly available information," such as an employee's title, salary and dates of employment. Thepolicy is aimed at shielding employees from anti-union groups' efforts at "dividing and conquering, from poaching workers, luring them away from unions . 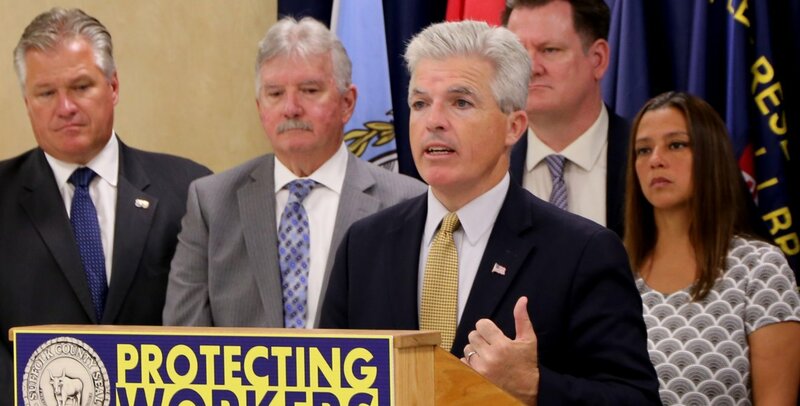 . . with the higher aim of weakening the unions," Curran, a Democrat, said during a news conference outside a county building in Mineola. Click here to read about a similar order in Suffolk County.